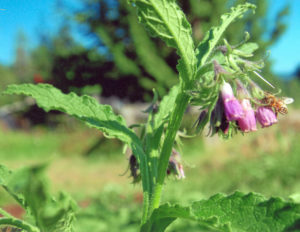 (True Comfrey) (Symphytum officinalis) Herbaceous perennial native to Europe. 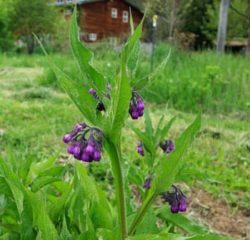 There is a white/cream flowered type and a purple flowered type. This is the purple flowered type. The plant grows true from seed. Traditional usage (TWM): Cell proliferation, cuts, scrapes, deep injuries. 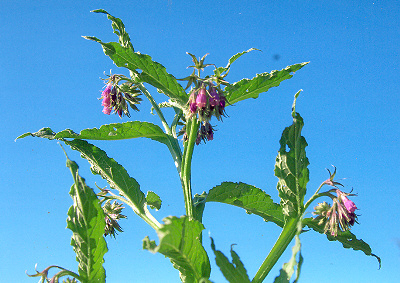 Source of allantoin, mucopolysaccharides and also potentially toxic pyrrolizidine alkaloids. Often recommended for external use only. 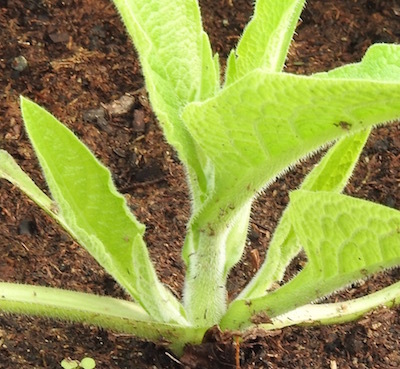 Commonly employed as a companion plant to orchard trees and as an ingredient in compost tea and compost piles. 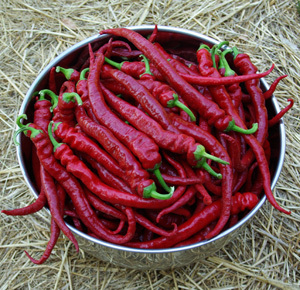 High in protein, the leaves make a good feed for chickens and pigs, may be added to the feed of all domestic animals, helping maintain good health and weight gain. Comfrey prefers a full to part sun position with rich, moist, but well-drained soil. Sow the seed just under the surface and tamp in securely. 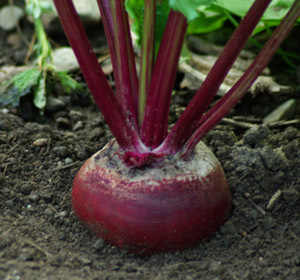 Sown directly in warm soils, germination usually occurs within 30 days. A 30 day period of cold, moist refrigeration followed by planting in warm conditions will speed germination appreciably. 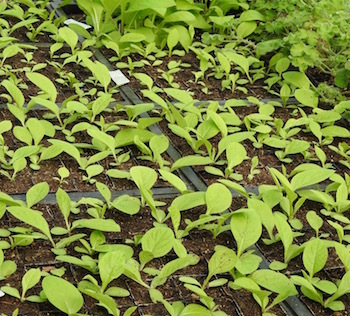 Grow the seedlings out in pots for about 3 months, then transplant to the garden. 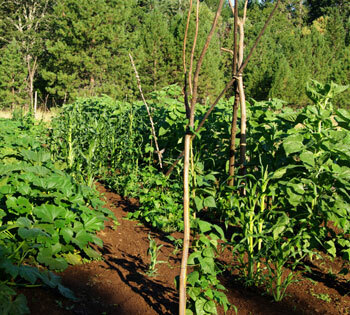 You can also direct-seed into a fertile bed in the spring, as soon as the soil can be worked. If you don’t want the plants to spread, then cut them back when they make flowers, and mulch the crowns with the leaves. This will keep the seed from maturing and dropping, and will quickly improve the soil and contribute to the formation of large, healthy and happy plants. 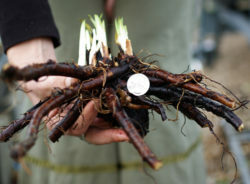 Hi Richo, When preparing comfrey root for an oil soak is it necessary to take off the black skin that surrounds the root? I cut the roots up, grind them and let them dry before putting them in oil. Is this the best way to process the root or do you have other suggestions? Thank you for your time. Hello Helena, it is good to give them a scrub with a brush to get them completely clean before processing, but you do not have to remove the black skin. I like the way you are processing the root, it is fine. 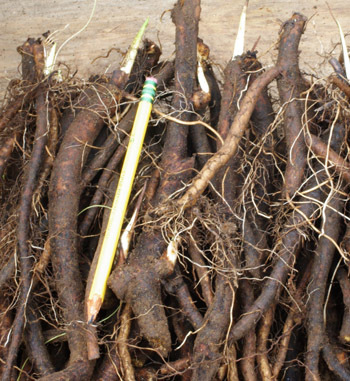 Another way (as per making plant medicine) would be to scrub the fresh roots, slice, dry and grind to a powder, then stir this into your oil to infuse. 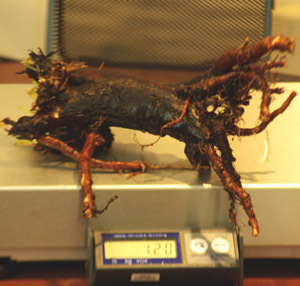 Bottom line, use dried root, not fresh. Sir, As requested I’m submitting a germination report for the comfrey seed that I purchased and the extra that you so generously gave me. To begin with, I’m sixty years old and have been gardening seriously for about forty years now. While nowhere near an expert at least I’m nowhere near a beginner either. Decided to start the seeds in pots rather than plant them in place in the garden which turned out to be a good thing what with the crazy weather this year. Probably my worst garden ever. I imagine I’ll get hungry this winter. I still have not been able to build a greenhouse which I so desperately want but hope springs eternal and I hope to have one while I’m still agile enough to use it. 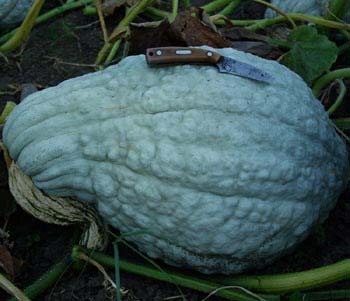 The report is a little flawed because, for some reason, I forgot to mark the quantity of seeds in batch 5493. It was either eight or nine seeds and for the life of me I can’t remember which. The packages with batch number 4955 on the label each had ten seeds as stated. I used a mix of clay and plastic pots with new potting soil purchased for the test. Pots were placed in trays on my porch as I had nowhere else to put them. Both lot numbers performed similarly, no major difference between them. 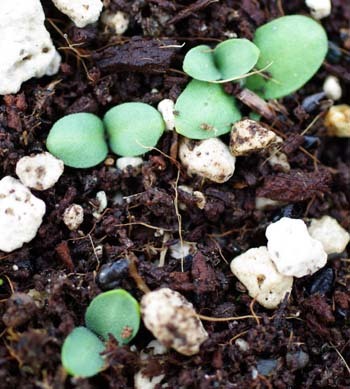 I must say that at one point I almost gave up and chucked the pots as the quickest seed to germinate took twenty-one days and the slowest took thirty days. I am puzzled by the lengthy germination time I encountered. 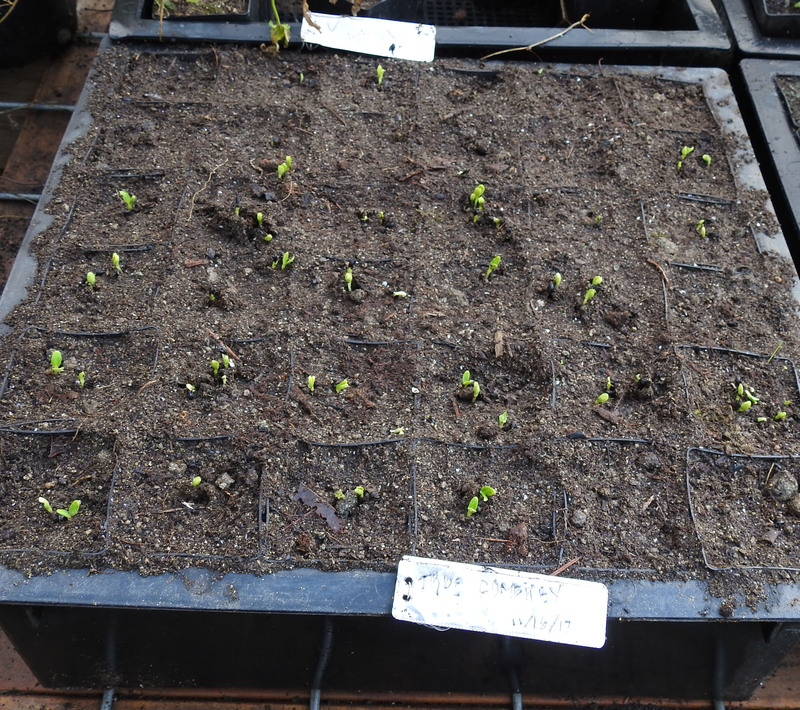 I can see how someone that was more of a novice than me might give up on the seeds if they hadn’t seen any sign of germination after three or four weeks. I was beginning to wonder myself, but had no other use for the pots or the space so left them alone.